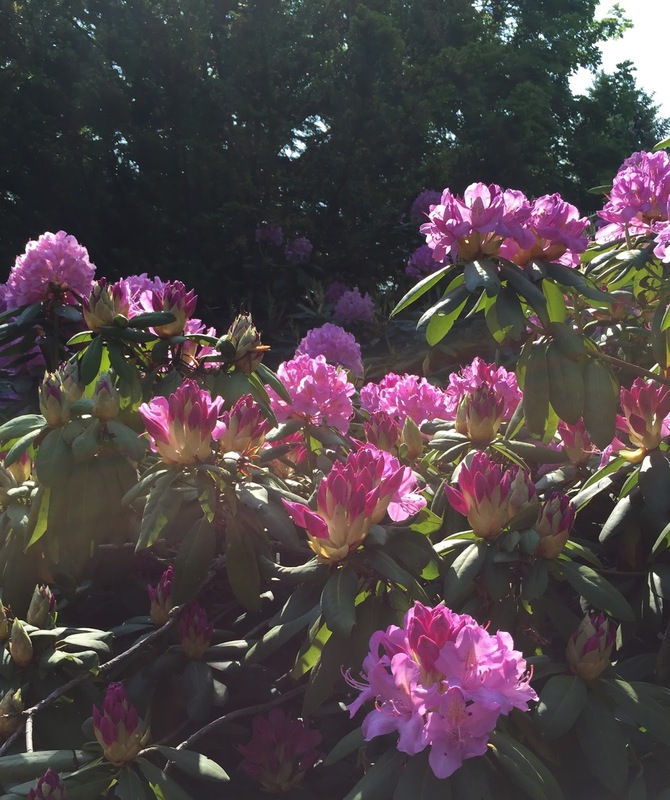 A few days ago, I had to trim a rhododendron shrub while it was in bloom. 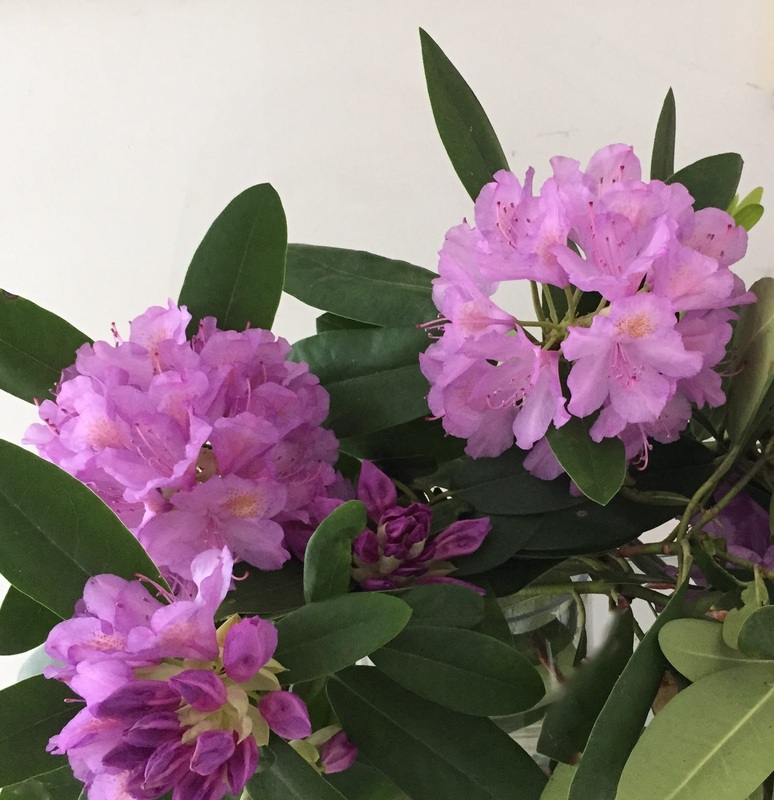 It made me sad to cut the beautiful blossoms down, so I decided to bring some of them indoors. They have been in a vase in my kitchen since then. 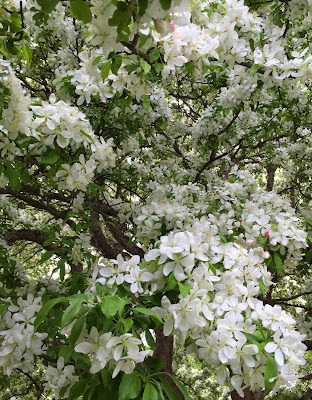 I have been enjoying having a close-up view of the blossoms. I have been meaning to draw them, and tonight I finally got around to it. I got out my color Sharpie marker set (a Costco purchase but I love it!) and started to sketch. I kept going longer than I intended to, but I had fun and it is always good practice to draw from observation. This morning I went outside to water the new day lilies I put in, and was rewarded by this view of rhododendrons in the morning light. They were so beautiful that I decided to take a picture. Tonight I used iPhoto to crop the original version to get this composition. This image began with a photo that I took back on May 14, during a walk at the Cummings Center Pond. 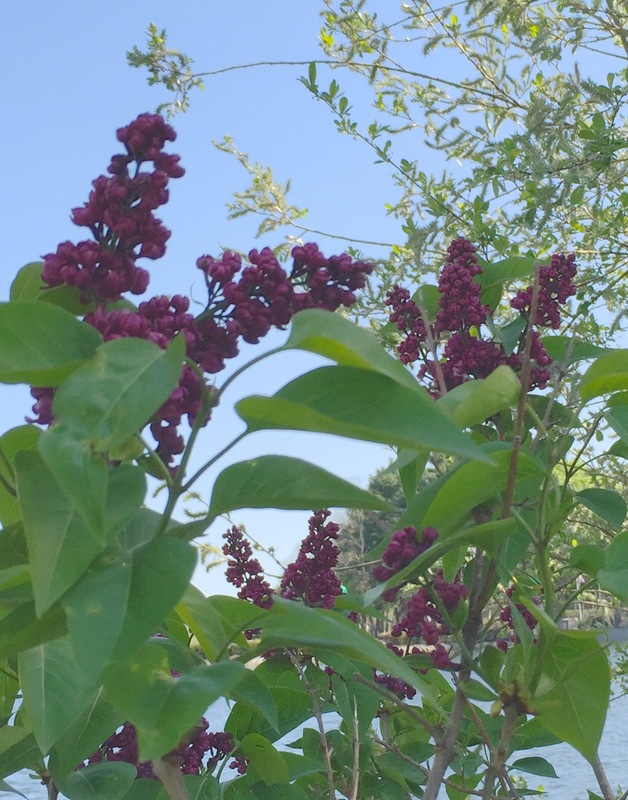 I liked the way these dark lilacs looked against the water, so I took a picture. Tonight I edited the image in iPhoto and cropped the original image to get this composition. Yesterday I had to trim a rhododenron bush because it was blocking the way. I hated to do it because it was in bloom and the blossoms were so beautiful. So I gathered up all the blossoms and brought them indoors so I could enjoy them. Plus, this would be a chance to see the blossoms close up. 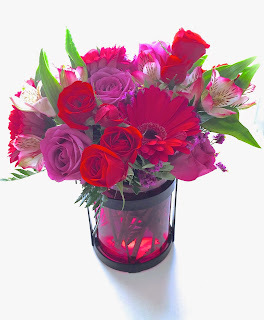 I put them in a vase, and they made a great big sprawling bouquet. Today I took some pictures, and cropped this image out of one of the best photos. I have been working on this illustration for the past few days, mostly putting in the background color, but today I finally finished it. 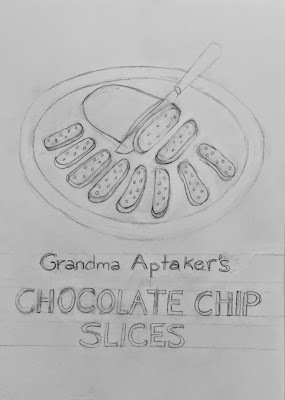 This illustration is for a recipe that is soon to be published on our food blog. 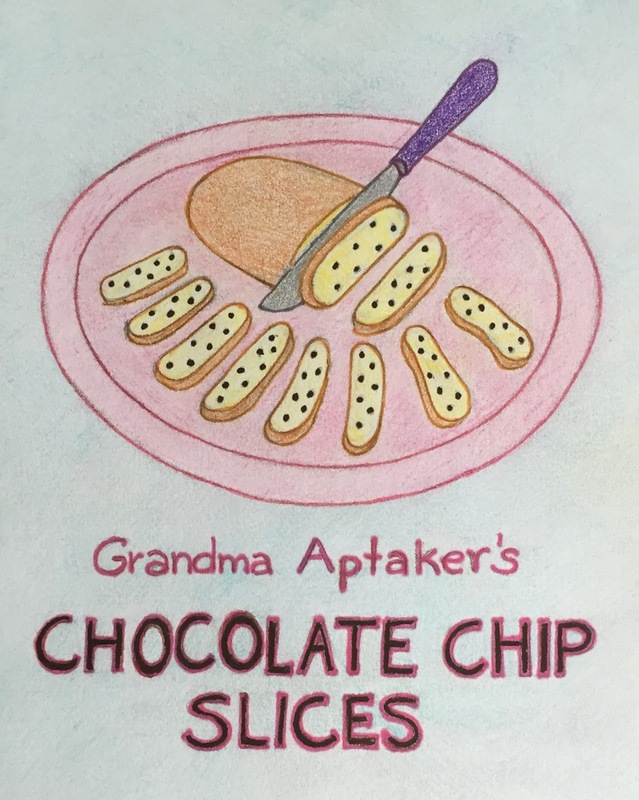 * This is Grandma Aptaker's recipe for chocolate chip slices. Grandma Aptaker was my husband's grandmother. She was originally from Russia, but lived in New York City, and then Pueblo, Colorado, which is where I met her. I used to watch her cook. She didn't use recipes, but I watched her cook, asked questions, and wrote her recipes down so I could make them myself. These cookies are shaped like a European cookie (mandelbrot or biscotti), but with very American chocolate chips. 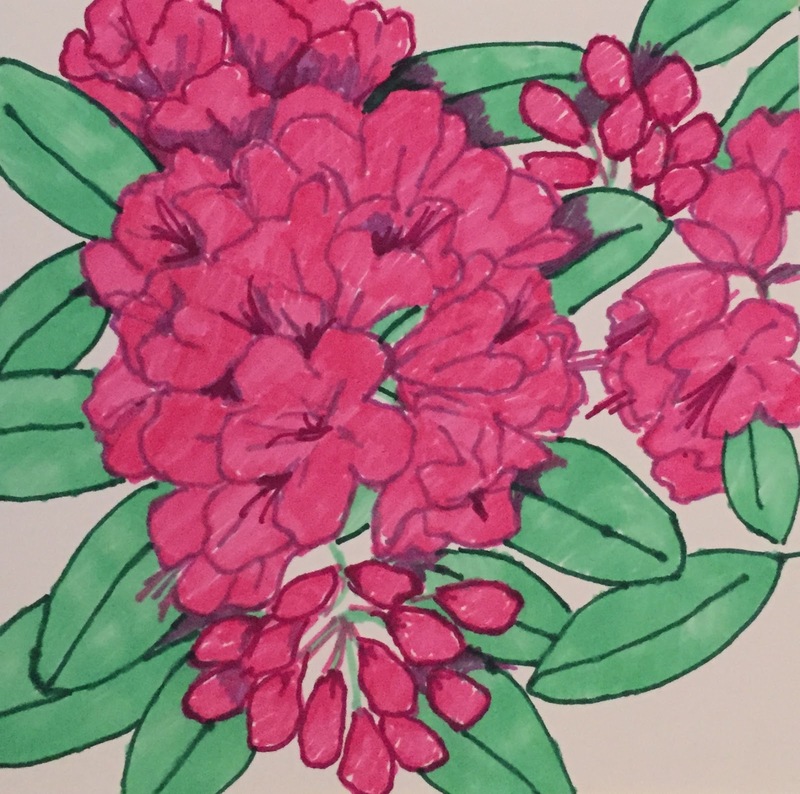 I plan to post this illustration as well as the recipe over the next few days. *(You can see our blog at seasoningforeverypalate.wordpress.com. Here is the illustration I have been working on as it looked on May 25th. I started adding color, beginning with the lettering (which I had already decided would be brown and pink) and the food, because the color is already determined. 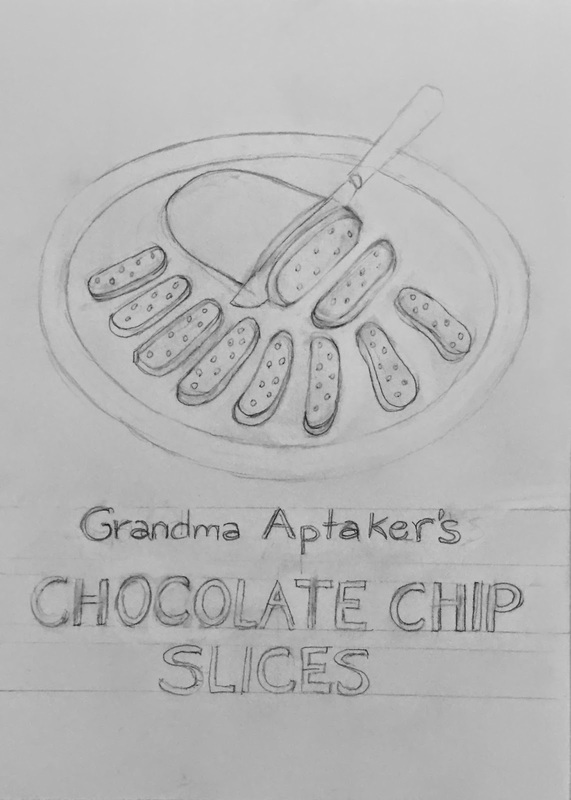 This illustration is for a recipe that is soon to be published on our food blog. 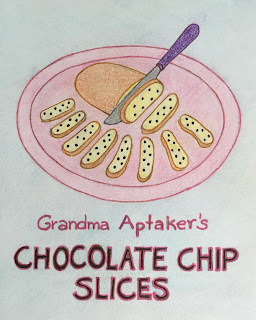 * This is Grandma Aptaker's recipe for chocolate chip slices,shaped like mandelbrot or biscotti. 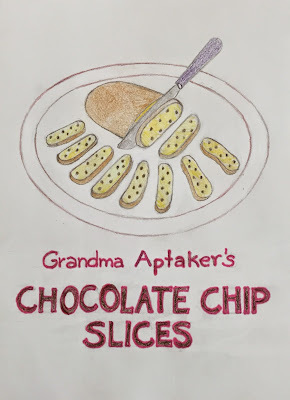 (Grandma Aptaker, my husband's grandmother, came from Russia and I always loved the surprise of those American chocolate chips in her Eastern European cooking repertoire.) 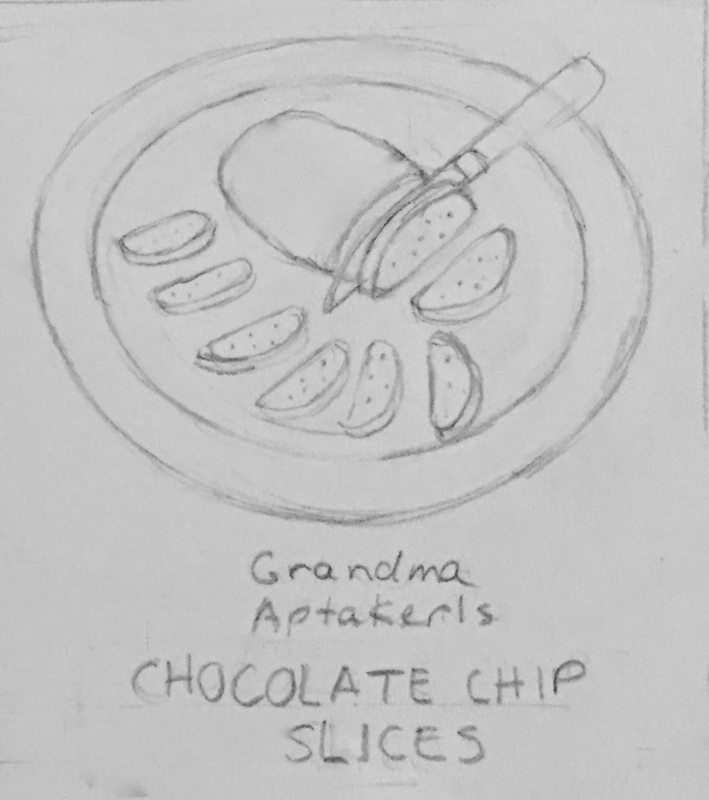 I used to watch Grandma cook and wrote down the recipes. I was thinking about an image for memorial day, and I remembered this drawing of a memorial candle that I made on my iPad with the Brushes app. 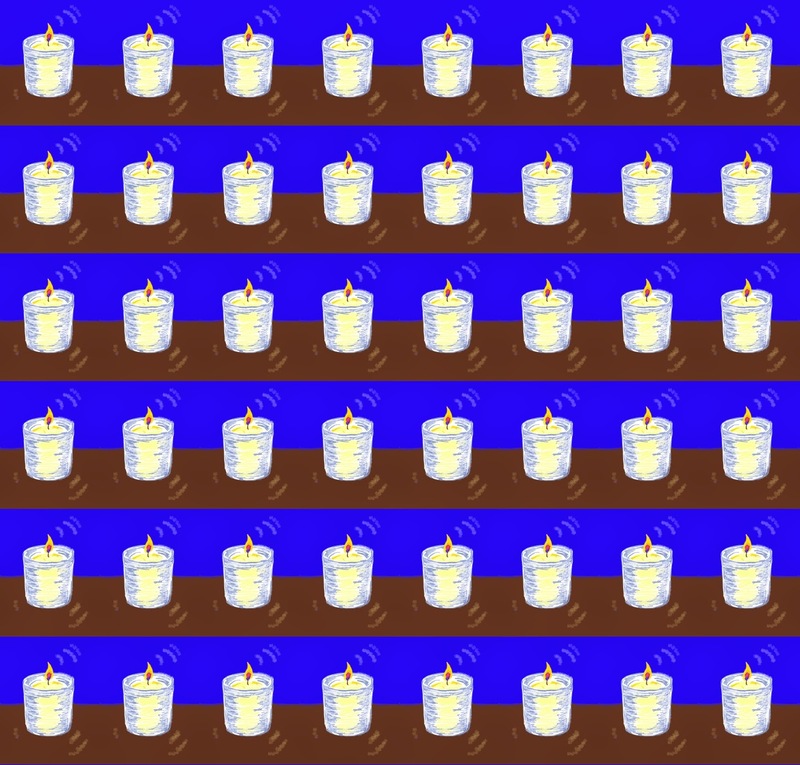 * I originally created this for Yom Kippur, the Jewish Day of Atonement, because a memorial service is held that day. 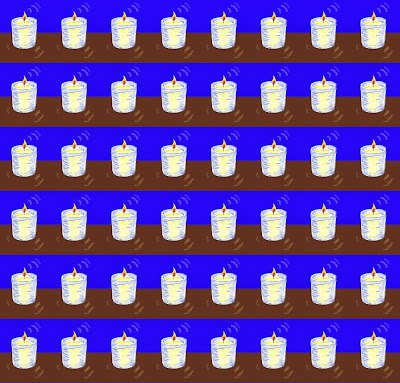 Today I used my digital drawing to create a pattern in Painter. So here is an image of many memorial candles, to remember the soldiers who went to war and didn't come home. It's time to post another family recipe in our food blog, Seasoning for Every Palate (seasoningforeverypalate.wordpress.com.) 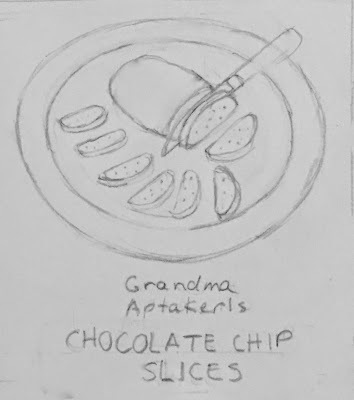 This is going to be another one of Grandma Aptaker's recipes. (She was my husband's grandmother and before I got married, I used to watch her cook and write down her recipes.) 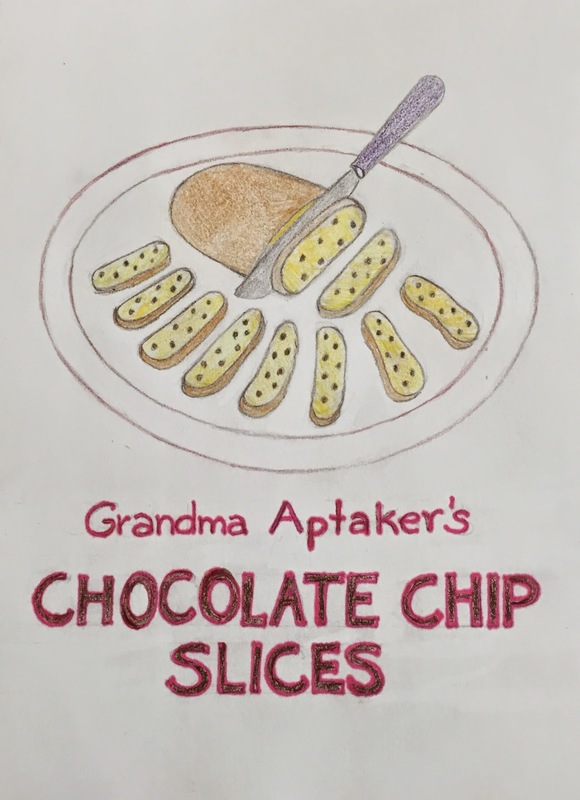 So the recipe is going to be for her chocolate chip slices, like mandelbrot or biscotti. I had some ideas for the illustration, and last night I did this quick sketch on a small piece of paper. Here's another image from yesterday's long walk in the Goat Hill neighborhood, here in Beverly, MA. We set out after dinner and were just in time to see the sunset over the water. Of course, I took some pictures. Tonight I used iPhoto to edit one of the best of them. After dinner we took the dog on a long walk through the Goat Hill neighborhood, here in Beverly, MA. We found a little pocket park close to the water. (The sign says, "Please Enjoy This Public Way" and we did.) 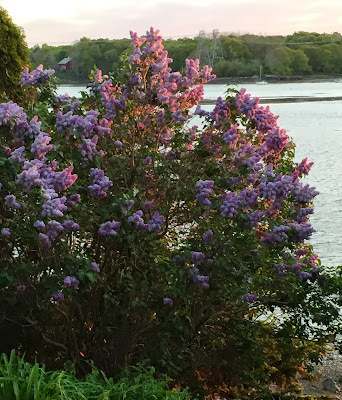 We were expecting a nice view of the sunset and the water, but the surprise was those lilacs in the light of the setting sun. Yesterday's post was a picture that I took in Lynn, MA, of the waves rolling in. But sometimes a still photo just won't do, so here is a little video clip. 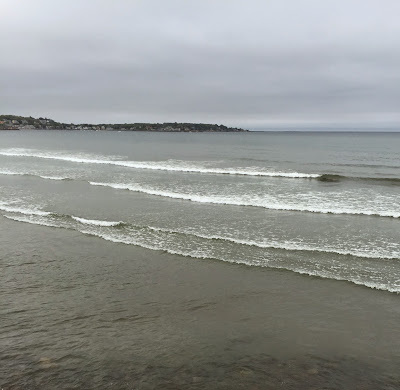 Today's excursion was a long walk along the beach at Lynn Shore Drive in Lynn, Massachusetts. It was cloudy and cool today, which is not great beach weather unless what you want to do at the beach is to take photographs. I love to watch the waves move in. It is tricky to take the picture at just the right moment, but fun to try. Tonight I cropped the original version to get this composition. Another photo from yesterday's trip to Long Hill Gardens in Beverly, MA. Everyone loves to photograph this red pergola, and so do I. Yesterday it looked beautiful framed by pink azaleas, so I took another photo. Tonight I edited it in iPhoto and here it is. 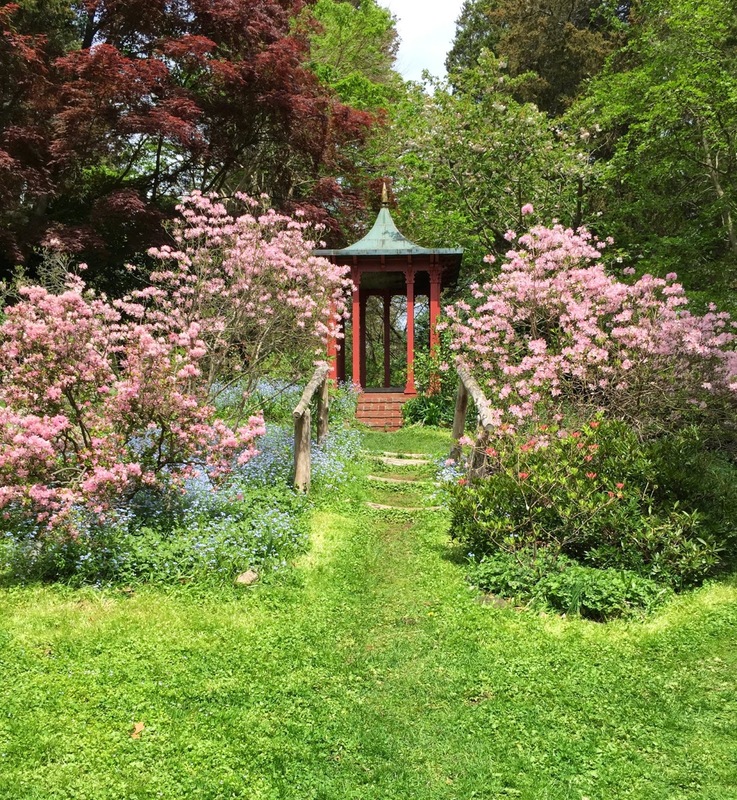 Today's adventure was a trip to Long Hill Gardens right here in Beverly, MA. We thought the lilacs might be blooming, and they were. 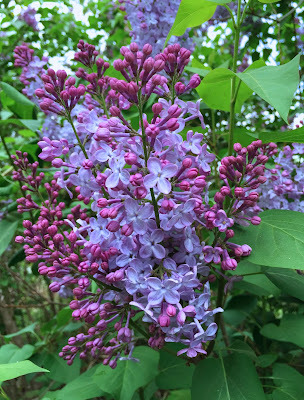 There is a double row of lilacs lining the main road, and we looked at all of them, comparing colors and scents. I took a lot of pictures. These have a pink cast, especially the buds. However, the image in my computer looked a little too pink, so I made a tiny adjustment to the color. 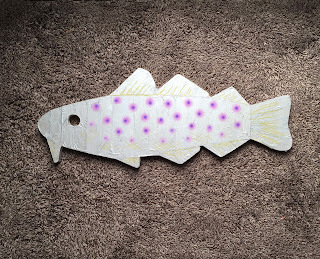 I have been decorating a wooden cutout of a codfish. (For the 50th anniversary of the Marblehead Arts Festival, fifty local artists are decorating codfish.) The decorated codfish will be on display in Marblehead. Yesterday's post was a photo of the final version of my codfish, titled "Gilda". (I also painted the reverse side of my codfish to make it look more finished. Also, if it should be on display in a store window, the back may be visible from inside the store.) The edging of silver tissue paper was already as neat as I could make it, so I just painted the back with gold acrylic paint, and signed it with a silver ink pen. So now my codfish is signed, sealed, and delivered. I dropped my codfish off in Marblehead this afternoon. I finished my codfish project yesterday. 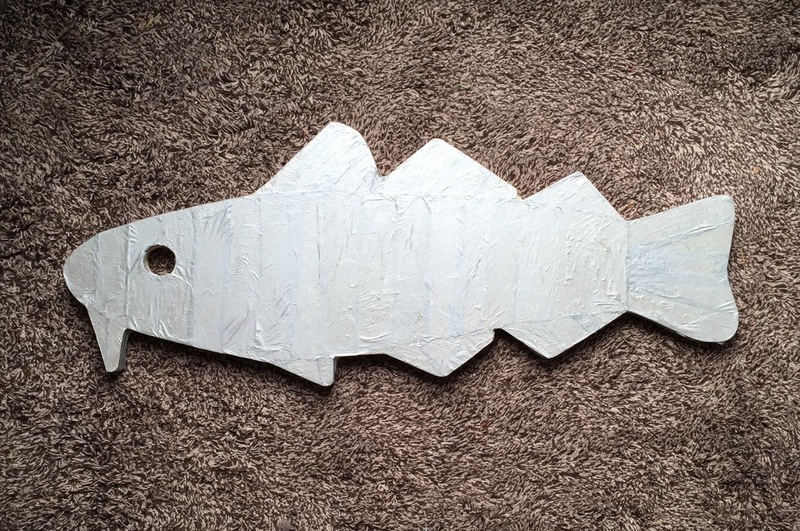 I am one of a group of fifty local artists asked to decorate a wooden cutout of a codfish to be donated to the Marblehead Arts Fest. A few days ago, I thought I was finished, apart from some fine-tuning, but I decided to add some gold in a darker color to accentuate the shape of the fish. I also added some more lighter gold to the surface of the fish. (I also painted the back of the fish with gold paint and signed it in silver ink: will post a photo tomorrow.) Good thing I am finished because this codfish needs to make it to Marblehead by the 16th. Final title: Gilda, which is what I named her, because of the gold paint -- and the gills. Here is my codfish project as of May 9, 2015. (Alternative title: Codfish on Studio Wall.) 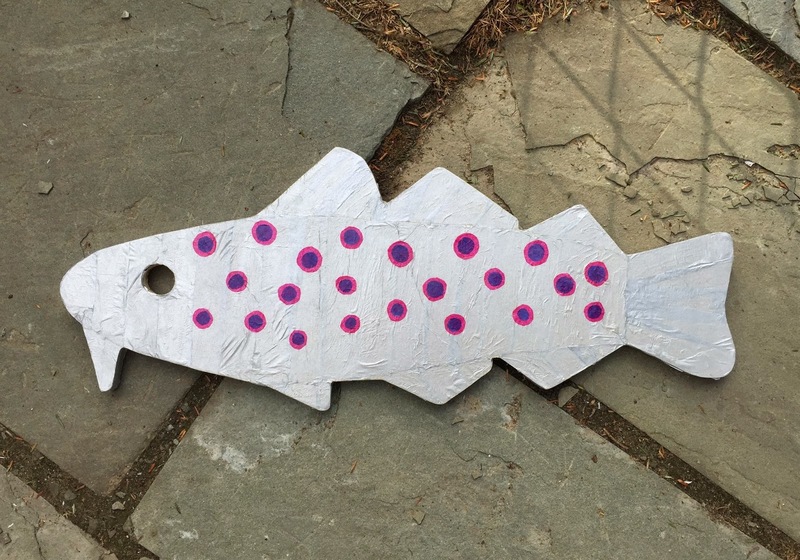 Fifty area artists have been asked to decorate wooden codfish cutouts for the Marblehead Arts Festival. This is mine, as it looked on May 9, 2015. At this point, I was doing a lot of cleanup work, making sure everything is pasted down, trying to get the surface as smooth as possible, etc. This part is tedious and not visually interesting. But I decided to have some fun and hang my codfish on the studio wall, and this is how it looked. Here is another picture of my codfish project on the easel, as it looked on May 8, 2015. This time I photographed it with the two woodblocks that served as trial runs. I am decorating this wooden fish cutout for the Marblehead Arts Festival. (Fifty area artists are decorating these fish cutouts, which will be on display in Marblehead and then auctioned off.) I have continued to work on my codfish over the past few days, finishing and fine-tuning it. But the basic idea is all there, and it is interesting to see how the idea evolved from trial run to actual. This is my codfish project as it looked on May 8th. (Alternate title: Codfish on the Easel.) I am decorating this wooden cutout of a codfish for the Marblehead Arts Fest. At this point, I had finished the mouth with some blue tissue paper, and added more gold to the fins and tail. Still to go: finishing work, neatening things up, pasting things down. I am thinking about putting some gold accents on the sides of the piece. And if there is time, I might decide to paint the back of the cutout with gold paint. 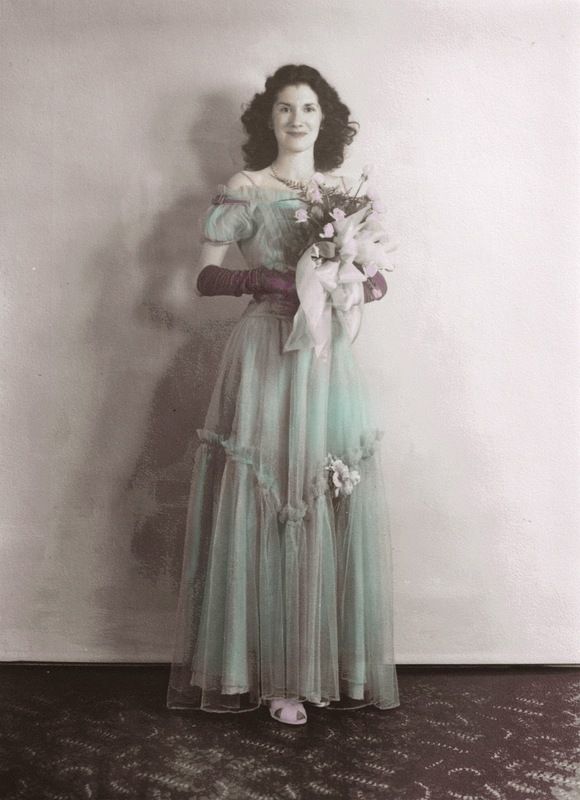 This is a photo of my mom at my aunt's wedding. My mother was matron-of-honor. Last night I scanned a black-and-white version of the photo into my computer and used Painter to add some soft color and then posterized it. (I already knew the colors of the dress because I once wore it to dress up as Queen Esther for Purim. But I referred to a tinted version of this for the color of the roses.) I think this is a beautiful photo of my mother, and I believe my father thought so too. As for my mother, she didn't have a clue that she was beautiful. Here is a closeup of my codfish project as it looked on May 7, 2015. (I am decorating a wooden codfish cutout for the Marblehead Arts Fest.) In this view, you can see the markings of the fish and gold accents I added. I used a small piece of netting and gold paint to simulate the pattern of scales. I dipped the netting in the paint, then made a little print by putting it on the surface of the fish and rolling a pencil over it. That worked, but sometimes left only a partial print, but I used a brush to add the "missing" marks. This is my codfish project as it looked yesterday morning after I worked on it. (Alternate title: Codfish on the Back Porch.) I am decorating this wooden fish cutout for the Marblehead Arts Festival. (Fifty area artists are doing this; the codfish will be displayed and then auctioned off this summer.) Yesterday I added gold accents to the fins. I also suggested the pattern of scales with gold paint and a piece of net. And I finally decided to give this poor codfish a mouth. To be continued. . . . Mother's Day started early! This morning I received a beautiful bouquet. I love the bright colors, hot pink and bright red flowers. I took some pictures today but when I got the images into the computer tonight, I could see some problems with the exposure, too many shadows. So I did a little editing in iPhoto and the colors began to pop! Here is my codfish as it looked this morning. (Alternate title: Codfish on Flagstone.) This is the wooden cutout of a codfish that I am decorating for the Marblehead Arts Festival. (Fifty area artists have been given this assignment, and an identical wooden cutout to start with.) Last night I cut out and pasted in the dark blue circles for the markings. This morning, I took my my codfish outside and photographed it in on the flagstone path, with sunlight coming through the chain link fence. To finish this project, I plan to add gold accents on the fins and on the body of the fish, to suggest scales. Here is my codfish project as it looked yesterday. (Alternate title: Codfish on Hardwood Floor. ) I am decorating this wooden codfish for the Marblehead Arts Fest. (Fifty area artists are decorating the same fish cutout.) Yesterday it was time to start pasting down bright pink circles. I had already done a "digital dress rehearsal" to work out the placement: I made digital "markings" on a photo of my fish, using Painter's digital pastel. (See yesterday's post.) Even though I was using my digital trial run as a guide, it made me nervous to start pasting the pieces down. But I am happy with the way the placement. To be continued. . . . I am decorating a wooden codfish cutout, to be donated to the Marblehead Arts Fest. (Fifty local artists are doing this.) I am using collaged tissue paper to decorate my fish, which will be silver with fuchsia and blue markings, and gold accents to suggest scales. By May 1, I had finished covering the wooden fish cutout with silver paper. I decided to do a digital dress rehearsal to figure out the placement of the pink and blue markings before trying it with "the real thing." So I opened a photo of my codfish in Painter and used some digital pastel to work out where I want the markings to be. Even though the colors are softer in this digital version, this is the general idea. I also tried out some gold accents on the fins. This is my codfish project as it looked on May 1, 2015. (Alternate title: Codfish on Umbrella Table.) I am decorating this wooden codfish for the Marblehead Arts Festival. 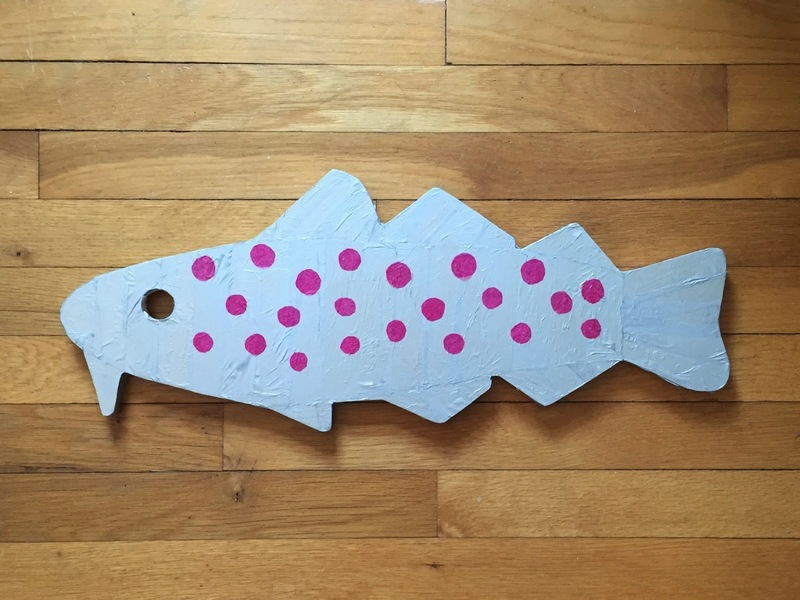 Fifty artists were given the same wooden fish cutout and their codfish creations will be displayed in Marblehead and then auctioned off. I have been covering my fish with silver paper, and at the time I took this photo, had finally finished putting the silver paper around the edges of the cutout. To be continued. . . . Here is my codfish-in-progress as it looked on April 30, 2015. (Alternate title: Codfish on the Carpet.) I am decorating this wooden codfish for the Marblehead Arts Festival. 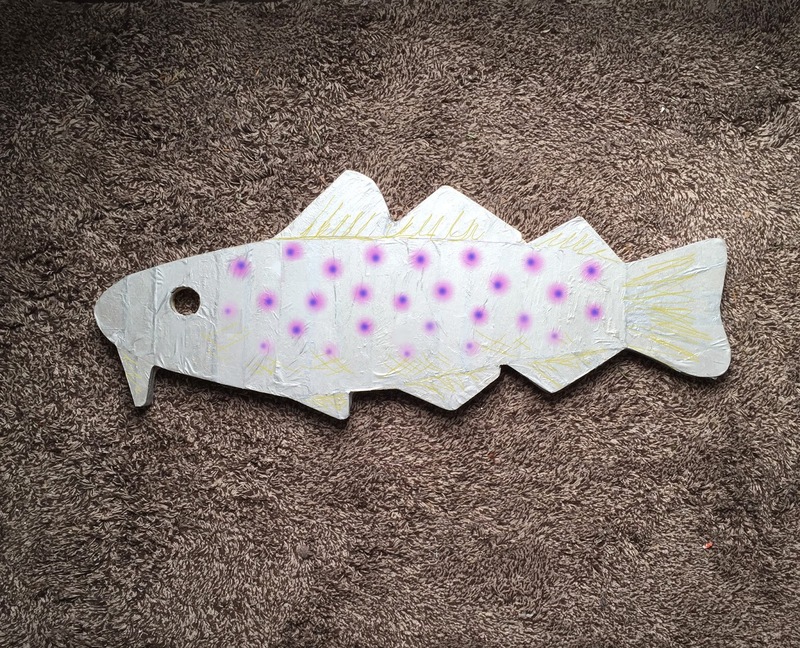 I am part of a group of 50 local artists who have been given a wooden codfish form to decorate. These will be on display in Marblehead and then auctioned off this summer. When I took this photo, I had finally finished covering the front of the fish with silver tissue paper, although I still needed to cover the sides of the form. 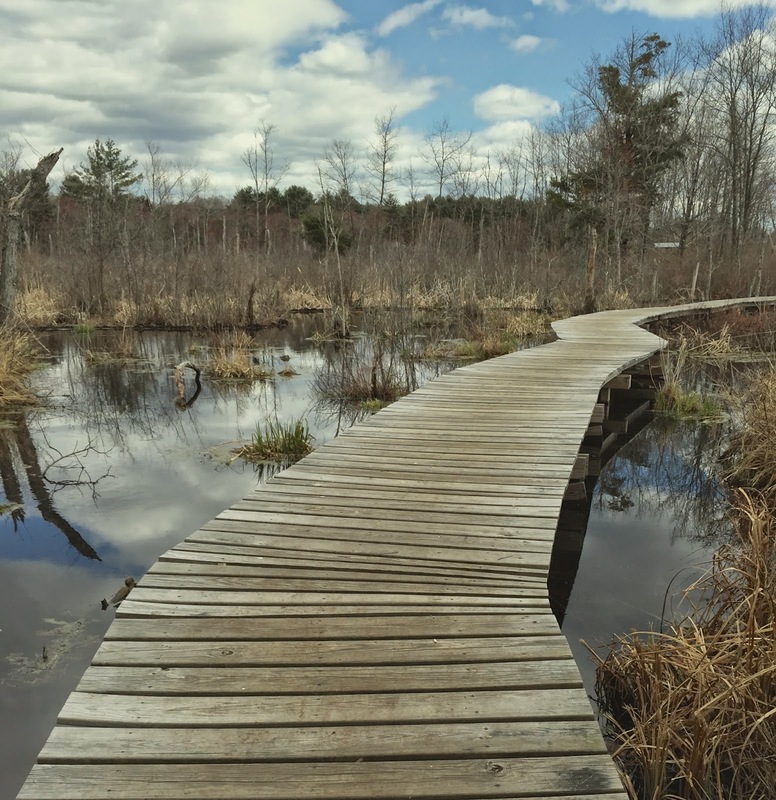 To be continued. . . .
Last weekend's adventure was a trip to the Danvers-Wenham Swampwalk. You can walk through a swamp on a wooden boardwalk. It was a lot of fun. I took several pictures, but I think this is the best one. The reflections of blue sky and clouds just below me were a bit disconcerting, and made me feel like I was walking into the sky. I tried to crop this photo to give viewers a similar sensation.